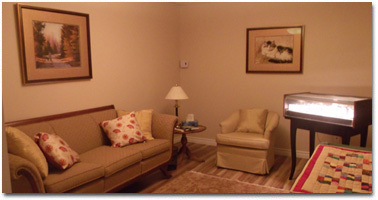 Born in 1998, Pet Friends Inc. was conceived by Averil Robinson through her profound affinity for animals. Averil visualized a much-needed service to support pet owners faced with the impending loss of their cherished companion. We all love our four-legged family members, and they deserve the utmost in dignified, humane and deferential treatment when they pass on says Averil Robinson, founder of Pet Friends. 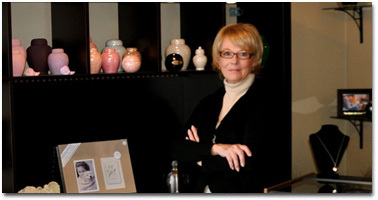 She has shaped Pet Friends to provide pet loving guardians with a complete array of cremation services and pet care specialty products designed to honor and commemorate. Our mission is to facilitate and alleviate the stresses associated with the most disheartening time of the human-pet bond at the time when you are confronted with heart-rending decisions and forced to say goodbye. Catering to both animal health care professionals and pet lovers alike, Pet Friends maintain the highest customer satisfaction standard in the Quebec industry. The care and sensitivity of our staff is an integral part of our service, and an important factor in why we are preferred by veterinary clinics and pet owners. Our dedicated, sympathetic staff is knowledgeable and able to answer all of your questions as well as provide advice on the broad range of options available to you. They care for clients long after the return of their pets ashes; we are always here to support and assist pet owners who are anticipating or grieving the loss of their beloved friend. 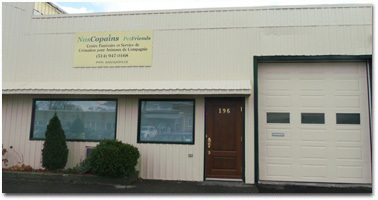 Our facility is a registered member of the International Association of Pet Cemeteries and Crematories (IAOPCC). We are governed by strict security and documentation procedures, therefore, maintaining the highest ethical standards of pet cremation in the pet industry. Your pet is guaranteed individual treatment in the cremation chamber and is clearly identified by a coded, numbered medallion and certification. After 15 years of caring for family's pets after they have passed away, we have now expanded to provide a funeral home for our families. We are open 7 days a week (by appointment on weekends and holidays). We extend an open invitation to all our families and future families to come and visit and meet my staff. The home euthanasia service that we have always offered is a special and much needed service for those who do not want to go to a veterinary clinic for the euthanasia. 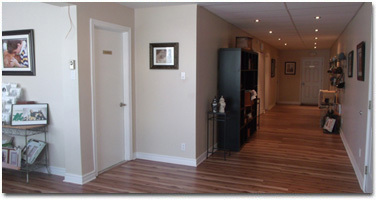 If you would like more information about all of our services, please call us at 514-947-0168 — in Vaudreuil-Dorion, QC. 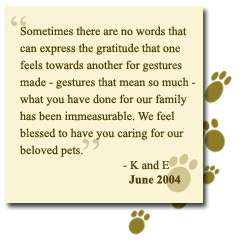 To pay tribute to your pet during every moment he/she is in our care. To instate and maintain a Code of Business Integrity in which both the pet-owning public and the veterinary industry can take absolute faith. To help each family memorialize their adored pet in the way most suited to their feelings and beliefs. To offer after-care pet loss grief support through our staff, our website, and our illustrious network of grief care specialists. Is the cremation process under the supervision of trained technicians? 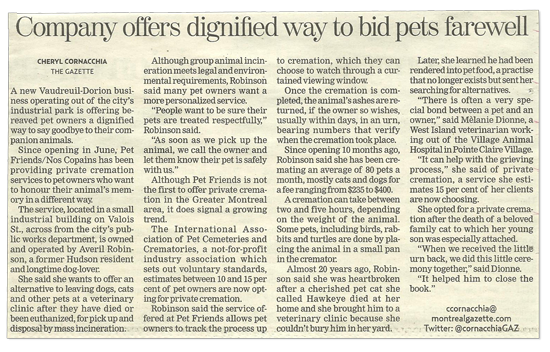 Is the crematorium a member of The International Association of Pet Cemeteries and Crematories? Does the crematorium observe government rules and regulations? When was the last time your crematorium was inspected by provincial regulatory officials? Is your crematorium large enough to accommodate pets of all sizes? What if I have a small pet, like a bird, am I able to get his/her ashes returned? Can I witness the cremation process? How and in what form are the ashes returned? How does the crematorium guarantee the full recovery of my pet's ashes? How is my pet transported and how do I know that my pet is properly identified?